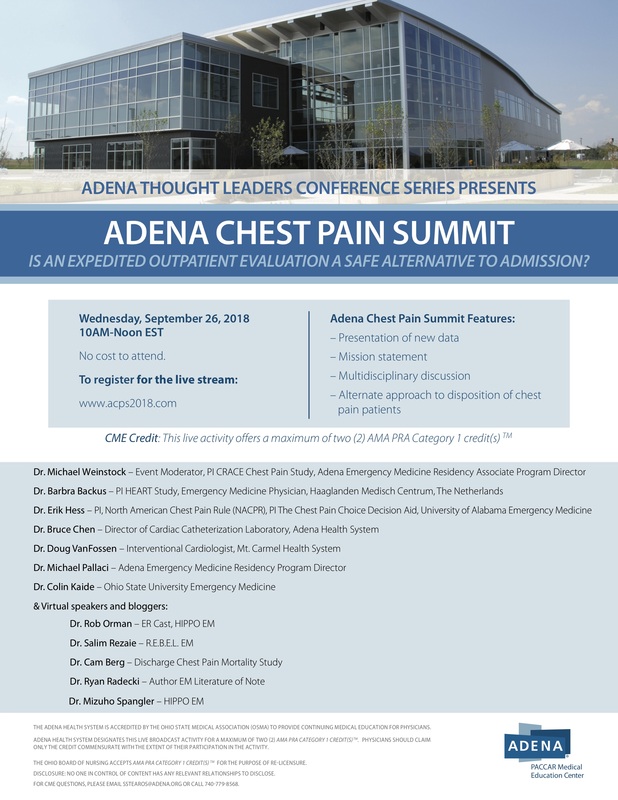 The HEART score is at the center of the Adena Chest Pain Summit 2018, where various chest pain dicision rules will be reviewed. Topics include cardiac risk scoring, how to integrate HEART score into ED decision making, and an in depth session on calculating HEART scores for advanced clinicians. Register now for the virtual event, and join the live stream at 10:00 EST september 26, 2018. Use the online calculator, or download the QxMD app for smartphones. Download this chart as PDF. 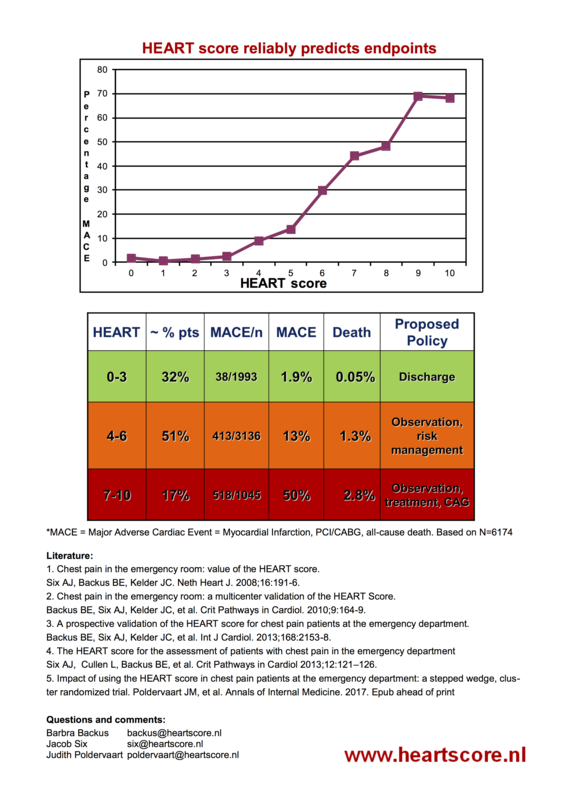 The HEART score is a scoring system for patients presenting with chest pain at the emergency department. 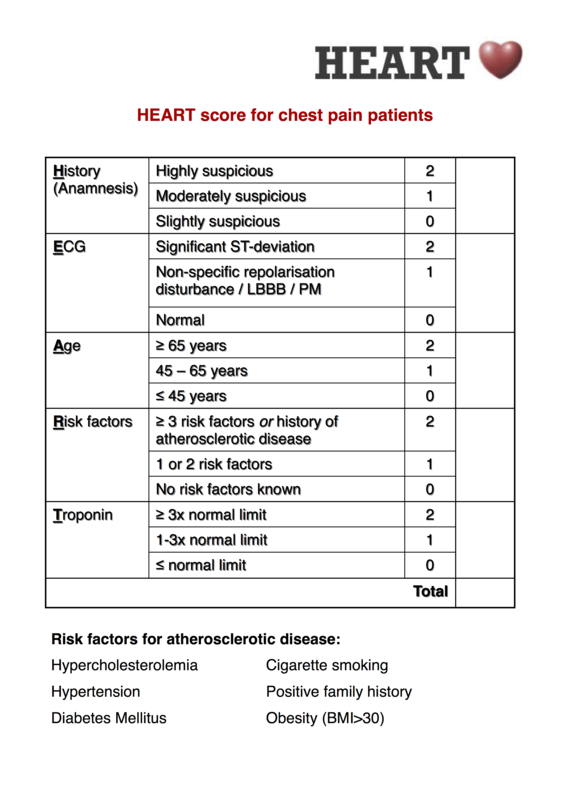 By assigning zero, one, or two points — towards a patient history, ECG abnormalities, the patient's age, any risk factors present, and troponin measurement — patients receive a score on a scale of 0‒10. The HEART score has been validated in several studies and has proven to be a powerful, easy, and above all practical instrument to separate patients into a low, medium and high risk groups. Patients scoring 0-3 have a 1.6% chance of experiencing a cardiac event, those with a score 4-6 have a 13% chance, and those scoring 7 or higher have a 50% chance of developing a myocardial infarction, PTCA, CABG or death within 6 weeks following presentation. With the HEART score it is immediately clear which patient is eligible for discharge without additional tests or emergency invasive procedures. In addition to the validation studies, an implementation study with a non-inferiority design has been performed in the Netherlands, which showed that the HEART score is just as safe as usual care. The results of this study are recently published in the Annals of Internal Medicine. Furthermore, a number of international studies using the HEART score are in progress or have been completed. See Publications for all publications on the HEART score. Copyright © 2017, HEART Study.